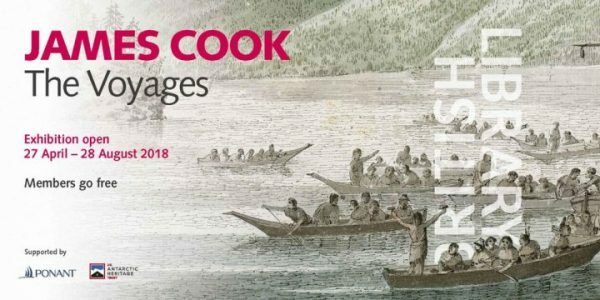 An exhibition entitled James Cook: The Voyages, currently on show at the British Library, gives an excellent overview of the journeys around the world taken by the famous explorer in the mid-to-late 18th century. The eponymous captain is of course known for being the first European to explore the eastern coast of Australia and, more contentiously, for having ‘discovered’ that territory and claimed it for King George III of Great Britain. The characterisation of these last points has been challenged by Aboriginal groups in Australia, whose ancestors had inhabited the land for some 65,000 years before Cook turned up, as well as others from around the world. In fact, it was through Cook’s actions that Britain claimed the territory as terra nullius or land belonging to no one. This allowed British Crown sovereignty to extend to the settlements made along the Australian coast and eventually inland, and to neighbouring islands as well. The legal concept of terra nullius was famously challenged in the 1980s and early 1990s by Mer islander Eddie Mabo, leading to the watershed Australian High Court decisionof Mabo v Queensland (No 2), in which Australia’s highest court dismissed once and for all the – frankly racist – view that land claimed for the Crown had been previously unoccupied. Mabo opened the door for claims in Australia by Aboriginal and Islander communities in respect of ancestral lands, many of which are still ongoing today. Now this particular legal postscript to the Cook saga is not shown in the exhibition, which instead focuses on the many other places Cook visited and explored on his three famous voyages. These include Hawaii, Tahiti and many other islands in the south Pacific, New Zealand, the west coast of Canada and even Alaska. Perhaps surprisingly to some, Cook had even mapped out part of the St Lawrence River in Quebec as a young man during the Seven Years War. There is one image in the exhibition that best captures the manner in which European powers claimed territories as their own, despite the fact that these places had local inhabitants and were replete with their own histories and power dynamics entirely foreign to western notions of sovereignty and control. It is a cartographical depiction of Tahiti (right), made before Cook’s first voyage, by a crewmember of the Dolphinin 1767. No plainer example can be given of the heavy-handed approach to territorial expansion used in the 18thcentury, the so-called ‘Age of Enlightenment’. 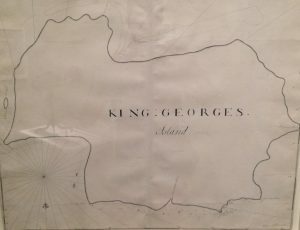 Whatever this island may have been before, it was now ‘King Georges Island’. And that was the end of the story. At least in the minds of the explorers. For those interested in reading more about James Cook’s voyage to Australia and the controversial acquisition of the ‘Gweagal Shield’ from a local Aboriginal group by members of the ship, read the comprehensive article written by Sydney-based lawyer Elizabeth Pearson, ‘Old Wounds and New Endeavours: The Case for Repatriating the Gweagal Shield from the British Museum’ (2016), for the Institute’s journal Art Antiquity and Law. This entry was posted in Australia, Heritage on August 10, 2018 by Alexander Herman.